How does the Steam Turbine rotate? 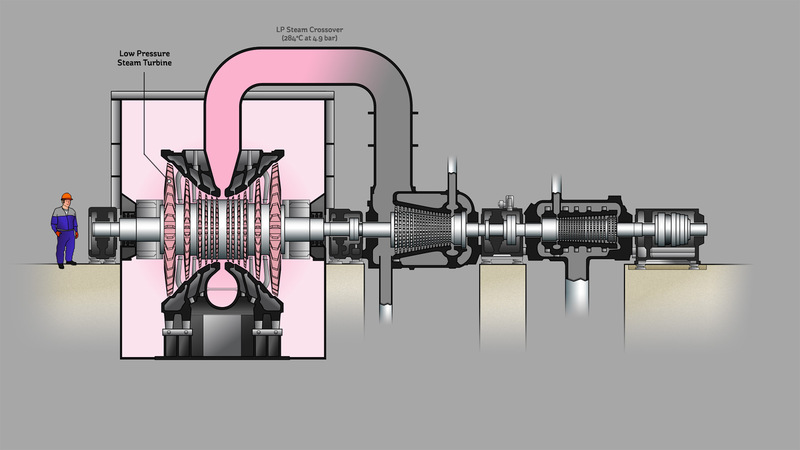 Believe it or not the physics behind how a Steam Turbine rotates is the same as that relating to how a plane takes off! Both items move under the influence of an aerofoil. Each blade on the turbine is akin to a small aeroplane wing. The topside of each blade is curved while the underside is much flatter. When the vapour impacts with the front edge of the blade the vapour is split into two parts. These two micro airstreams will join up again when the vapour rolls off the back edge of the blade. In order for the topside vapour to join up in time it must complete a longer journey (along the curved top-surface) and so it must travel faster than the underside vapour. This means the topside steam is more spread out and as such the pressure (force/area) is lowered. This creates a pressure difference across the turbine blades causing them to move. The moving blades rotate the shaft to which they are attached. It's important to note that the blades actually rotate on a circular path that is perpendicular to the flow path of the vapour.